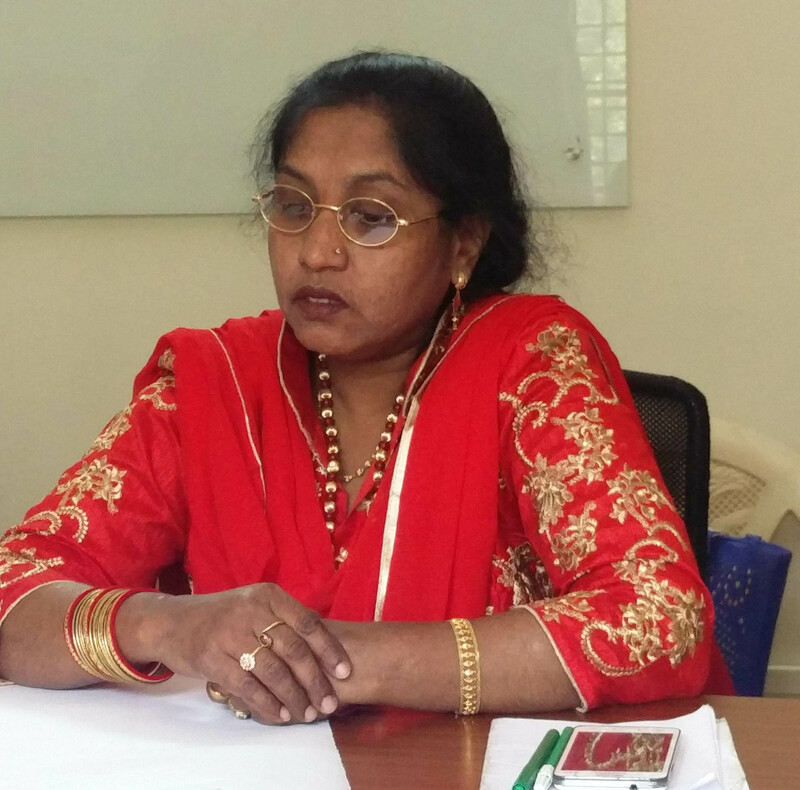 Dr. Kalavathi B.K, who is the Executive Director of Anveshna Foundationhas been the Master Resource Person for Akshara’s English Program since it’s inception. 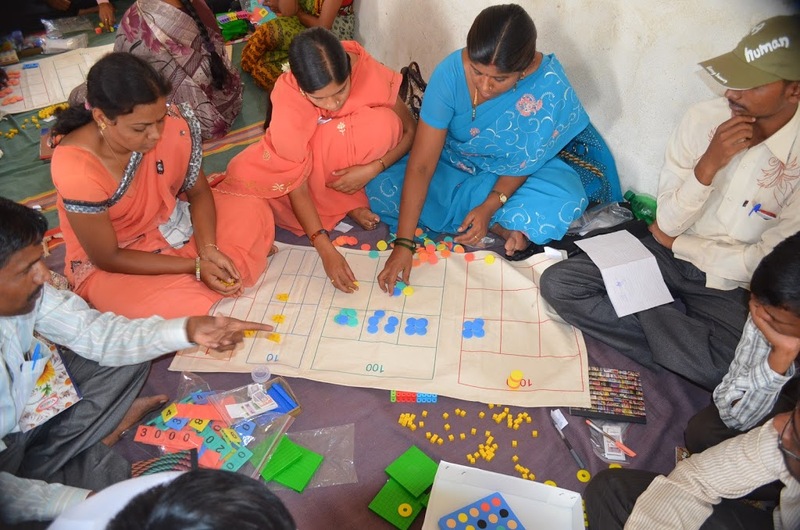 Here, Dr. Kalavathi, does and objective analysis of the components of the programme – the Teaching Learning Materials and the Training Package. Shares her experiences of the lasting impact created by Akshara’s Swalpa English, Thumba Fun on teachers, which enables them to teach English with ease in the classes. Training package: The package includes both Teacher’s manual and hands on training for the teachers as well as departmental Resource Person (RP)s . The Training manual is very simple with clear instructions to the teacher and the RPs; it has “Thematic Graded Content” which is teacher-friendly, based on inculcating Listening, Speaking, Reading and Writing Skills. It also instructs the teacher regarding the day to day transaction of each lesson very clearly and also mentions which TLM to be used along with the content. 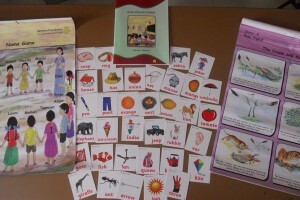 The package contains lot of language games and strategies which will enrich the English language environment in the class. The training is provided in two phases; Initial Orientation and refresher phase. Initial Orientation phase is for 5 days in the month of May and refresher phase for 2 days in the month of October. This is a teacher friendly training using various strategies and interventions in a workshop mode on a one to one basis. The training not only enhances the English Language skills of the teachers but also boosts their self confidence and motivates them to implement the package in the classrooms. It also provides them lot of extra tips regarding implementing the package in the classroom. The Statistics of the English Language Program of past 2 years clearly indicates the success rate of this program and can be validated as it is drawn through a pre-test and post-test design. 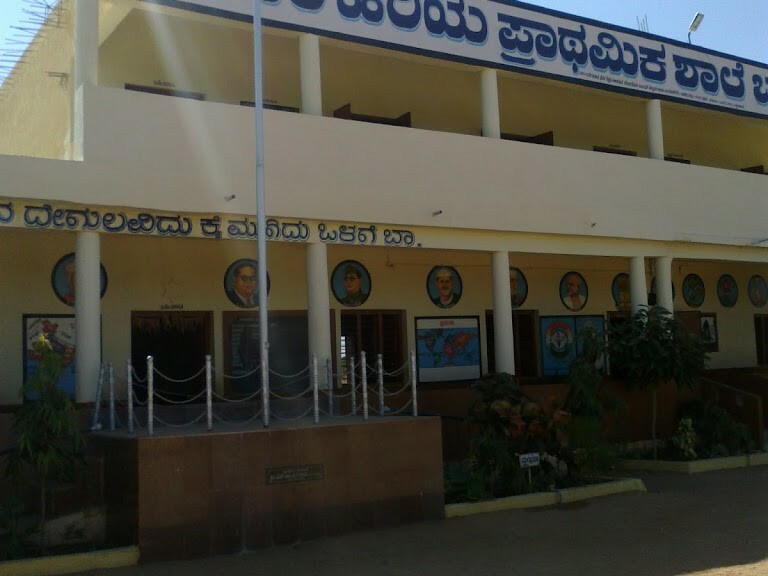 The program has inbuilt evaluation as the teachers have to plot on”Pragathi Nota” at the end of each lesson. They are supplemented by Stories, Alphabet Phonic Songs, Reading and Writing Material. The rhymes are supported with mobile rhymes to make the teachers recollect the way the alphabet songs and rhymes were sung. The workbooks have been differently graded for classes I, II, III and IV. The material developed has been simple, graded, attractive realistic and suitable to the grass root level- both for the children and Teachers. The print material used is also long lasting and child friendly. 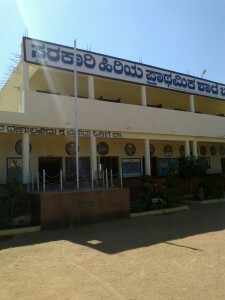 Measures have been taken to introduce the vocabulary which is familiar to the rural children. It has been upgraded and improvised on the felt need and feedback received by the stakeholders annually. My direct experience in the training classroom: The teachers as well as the RPs initially started with an attitude to mean- “Oh! another training!” Later, as they were made comfortable with icebreakers they settled into the comfort zone and got involved in the program. As the training was in a workshop mode with many strategies, they all willingly participated with interest. They found the rhyme sessions very interesting and asked for more new rhymes, they asked for the rhymes between the other activities as a warm up. They enjoyed the individual activities more than the group activities. In their session end feedback they said that they would look forward to more of Akshara English training program as it empowered them to use English in their classrooms. They also felt the workbooks and lessons were simple and realistic. It would help them to transact better as it was graded and attractively presented. 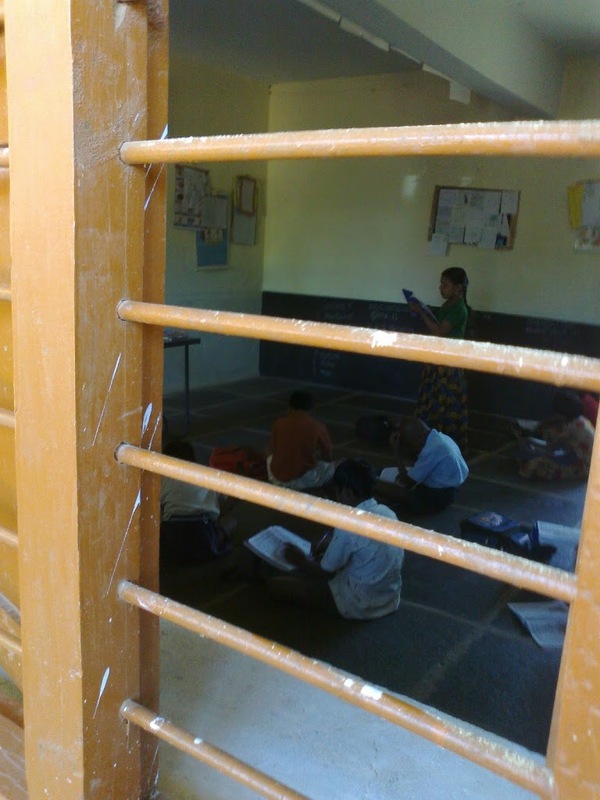 They wanted more of Grammar support and to fulfill this requirement Akshara’s monthly worksheets helped them a lot. 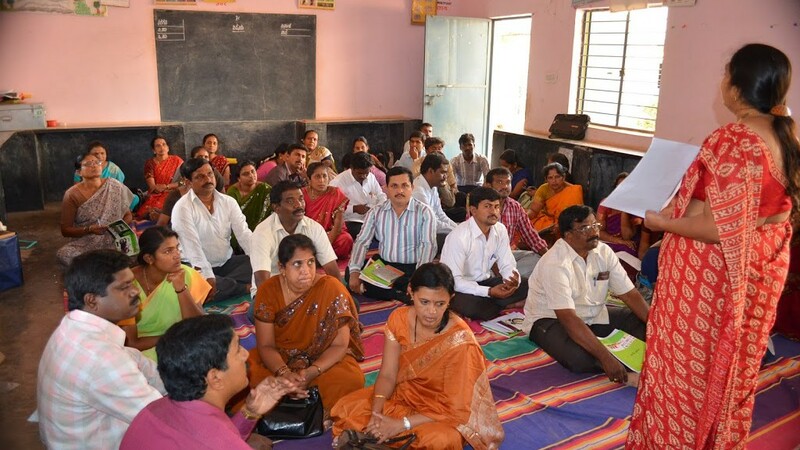 On the whole the teachers as well as the RPs actively participated in the training. Each one came forward to enact the stories as role plays and enjoyed it. They enjoyed the whole training program and said it was like going back to their school days. It was seen that by the end of the 5th day they were more empowered with spoken English and they also affirmed it by saying that it had built in the confidence and capacity to handle their English classes better, in unison all of them said that they would want this training again and again. They were also in touch with me during the break in between the initial orientation and refresher programs and it has continued to be. During the refresher sessions most of the participants of the earlier training sessions were present and they said they were looking forward to the refresher training. They said they enjoyed teaching alphabet phonic songs and were equally liked by the children and it made their job of associating the sound –symbol association, easy. They said this training has helped their children more and the children also were motivated to learn more. In the refresher session I noticed all of them spoke in English with confidence though some with errors. I also noticed that the errors had come down. At this point, I need to share a particular incident which touched me deeply, this happened during the first training program, where I had to train teachers of Bangalore North. The trainees were an assorted lot of all ages and backgrounds. There were elderly people who were about to retire too. The training program was rigorous and all of them had to be treated equally and I did it. The last day, a very senior teacher, who had all the while hesitated to participate freely, and who was not very fluent in English, came voluntarily and told me, “Beti, you are like my daughter and you have done the training very well and this has helped me. I will use it in the class for my children. I pray Allah to Bless you”, and that too in English. My day was made and I was overwhelmed with emotion and this action showed me how successful our training program was. I strongly believe “Action speaks louder than mere words”. Doesn’t this anecdote speak loads about the program? As I have mentioned in my direct experience, though the teachers and the RPs started with an “attitude”, they quickly realized the simplicity and ease of use and implementation of the program. The way the training was being given (individualistic) had empowered them to speak English and had given them the confidence to take it forward and teach/ train their children/ trainees. The many strategies which were used during the training sessions had given them clear picture regarding how English could be taught in a play-way method in the class. The package was realistic and simple and the training funfiled and interesting which motivated them to actively participate. The rhymes and stories selected were simple and teachable to their students. They also appreciated the “mobile support”. The TPR activities with language games were interesting. The conversation was useful as it involved simple day to day vocabulary. The TLM was attractive and easy to use. The workbooks were well graded with simple but attractive pictures helped them to motivate the children to write. There was a visible change in their English speaking skills by the second session. They were also eager to learn more English and implement in the class. They asked for clarification regarding the grammar doubts they had collected. They interacted freely and confidently. They shared their happiness regarding how their classrooms were charged with a fun filled English environment and how their children loved the English period now. Their sentence structures had visibly improved. Interaction with participants during activities: They found the rhyme sessions and role plays very interested. They also opined that picture reading and story building were highly suitable for their classroom. They said individual activities like pick and speak, dialogue extensions, division of attention activities helped them a lot to enhance their attention and confidence. They found the language web an interesting way to teach grammar and sentences. They also said that they liked the way hands on trainingwas being provided for each trainee which helped them in carrying over it to the class as well as the training sessions. We entered the BRC center in Mundargi for the 2day refresher session, only to be welcomed by bright faced trainees who said were very happy to see us back. They spoke in fluent English but ofcourse, with minor errors! Their level of confidence surprised me, each one was eager to share their training experiences as I started asking informally. Infact, we did not need an icebreaker to start the session but as it was in the manual we started, only to get the use of their imaginary money spent in funny ways and some did even say they had spent it on buying books for their school children. They all had used the past tense correctly! How they used the TLM in classroom? Why is TLM important in language learning? Has it helped children learn the English language? And feedback was collected regarding their usage of TLM and its effectiveness with children. It was surprising to see all of them boldly giving out their views without any inhibition. The main objective of the refresher course was to orient on reading skills for which the trainees had to use reading cards to blend associated phonic sounds. They clearly asked their doubts regarding blending and enquired why the blend has to be like this and why not like the way they wanted to use, which came as a pleasant surprise to me. It was a proud moment to see the “thinking and assertive teachers” who were showing their professionalism. The session also made the “self” engulfed to reflect and see why a particular activity should be done a particular way, there was also a query regarding the pronunciation of “the” with the vowel sounds and consonant sounds, which was dealt meaningfully and the trainee was contented and happy with the rationale. They also enquired whether we could have a teleconference with them every month to help them further better their English. The most precious moment was when even the most silent and withdrawn trainee of the previous session had opened up and expressed that the English training program had instilled confidence in him and he had carried it forward to his students and was happy when he saw them speak English with confidence! Isn’t that a wonderful gift? 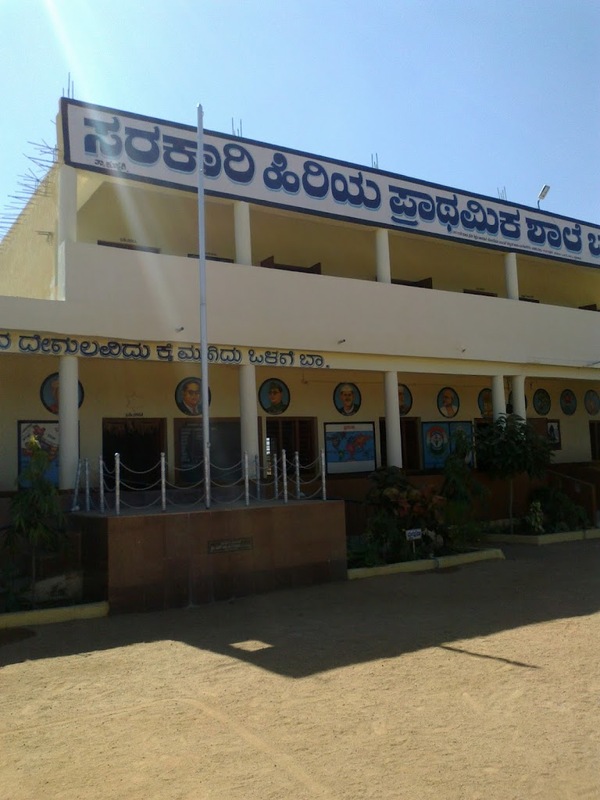 This year Akshara Foundation’s Inschool programme, focusing on basic numeracy and literacy skills in lower primary grades between 1 to 5, is going on in full swing in over 600 Government schools in Hoskote, Devanahalli, Kushtagi and Mundargi blocks in Karnakata. The programme is impacting over 43,000 children. 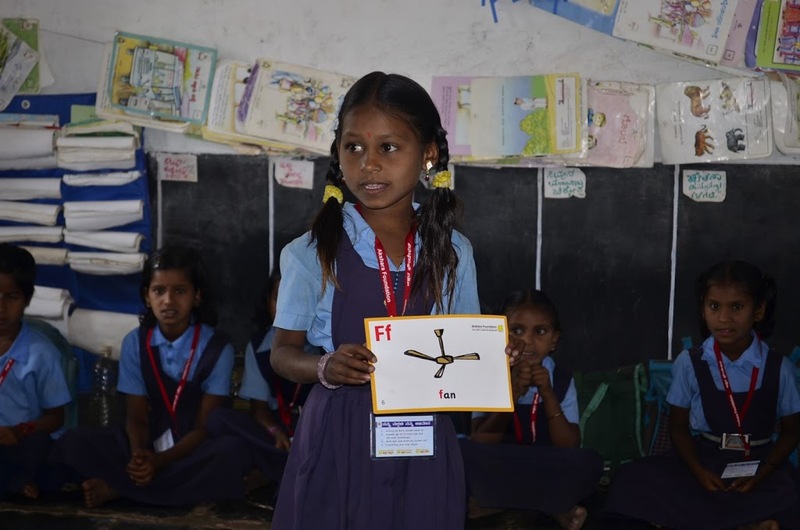 While the Akshara team has designed child-friendly Teaching Learning Aids, supporting the programme through constant interaction with the Teachers and measuring the programme through various assessment strategies, the programme is delivered in classrooms by Teachers themselves. A comprehensive training component is developed at Akshara focusing on basic English and Math knowledge that can aid teachers in the classrooms. The training is delivered in a cascading fashion through the education department Master’s Resource Persons (MRPs). A 5-day training in the beginning of the academic year is followed by a refresher training later in the year. This year, over 1500 teachers have been trained in the Akshara methodology and are currently delivering the programme in the classrooms. We have received overwhelming responses to the trainings. The teachers are very happy with our training and feel the programme will surely benefit the children. 1. British council training was in lecture mode where as the Akshara Foundation training was activity based. 2. The Charts, Flash cards, Teacher’s guide etc provided by British Council were not up to the mark. The Akshara teacher’s guide, cards, charts flash cards etc provided by Akshara Foundation were very good. These are very useful for children’s learning. 3. Importance was not given to the communication skills of the teachers in the training program of British Council. In Akshara Foundation training program importance was given to improve English spoken language abilities of the teachers and English grammar. 4. 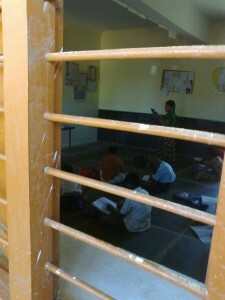 The techniques of developing basic language skills among children were incorporated in Akshara Foundation training. 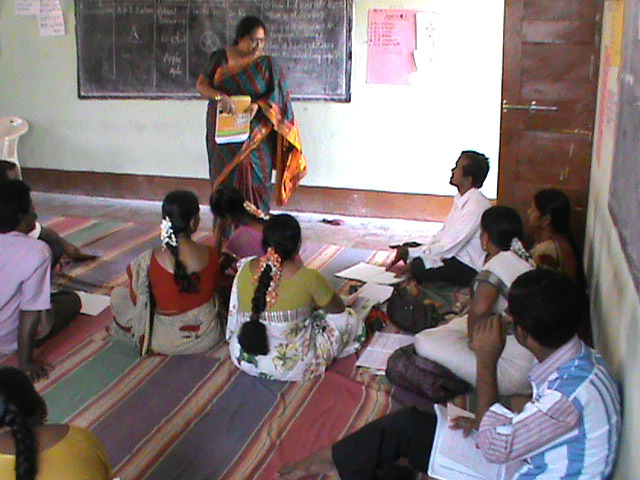 Akshara Foundation training caters to the needs of improving teacher’s skills in using English language. The methods of reciting rhymes and storytelling models were discussed. The Akshara Foundation gives good guidance. The basic grammar points have been covered. But some more grammar activities could have been included. I feel that this type of teacher’s guide, kit and training for teachers may be given to all the teachers in the state. We are thankful to all these teachers for finding value in our training and we believe that they will create a positive impact on the learning levels of children.